Social media listening is not only an everyday task these days, it's a 24/7 job. And the key to social media success is being able to act quickly on what is being said out there. The process of identifying and analyzing what is being said about your brand, your product, your service (or you, for that matter) on the internet is crucial for any social media effort. There are hundreds of tools out there for this – some simple, free, and some complicated and detailed. Either way, you need to monitor what's being said out there. So, why is it important? And how do you get it right? And how do you act on what's being said? 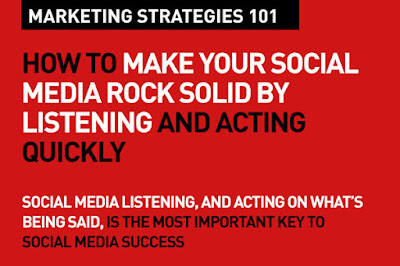 With the right listening strategy you can achieve a lot to help your social media efforts. Right way, you'll get to know where and when your target audience (your community) is – which platforms they prefer so you can then have conversations with them. You can identify influencers and advocates. You cannot ignore the part social listening plays in improving customer care. It's a great source for feedback. You can target and attract new customers. It helps you generate leads. Overall, listening is the most important component in your social media strategy. It helps and build every other thing you do on social. What is your listening strategy based on? This is the first step, and it's important to have a framework that guides you when you monitor what's out there. Are you monitoring consumer behavior? Sentiment about your brands and products – negative or positive – or the absence of it? Are you listening to generate leads and drive sales? Are you monitoring trends and news? All of this will help you decide how you will turn social voices into consumer insights for your brand. These insights drive your content. Create a list of keywords and terms and develop queries based on those. Be as accurate as possible. This isn't a shotgun approach, its sniper. The more-accurate your social listening is, the better you will be at finding sentiments, comments, actions, trends and opportunities to engage with fans. Once you know what's being said out there, you'll need a clear plan on how you'll be using the insights that you get out of what's being said out there. Being said about you, your brand, product, service, customer care, your competition, the industry you're in. Insights help you create content, and it helps you define your content forward plan. You can go to your client (if you're an agency), your management, your stakeholders and defend your content, the platforms you socialize on, if it's based on listening. Listening gives you data, and data is insight. It helps you ride trending topics, and build future content. It's being aware, and that's what should help you define what you'll say. I have said this earlier – God gave us two ears and one mouth for a reason. And remember, social listening is not only applicable to social media that your brand is on, but to all of online – where information about your brand, product, competition or industry may appear. These includes any website, blogs, forums, other social networks and search engines. You cannot turn off your ears. That makes you deaf. And dumb. Use tools to listen round the clock. Automate if necessary. Actually, automation is a great idea. There are several tools that not only help you automate listening, but improve your whole social effort. You cannot go in once a week and dig through your Facebook insights. It's a 24/7 job. Social media fans love when you are listening to and responding, building conversations around what's hot and happening. This also helps you expand your base – folks in social who don't fan or follow you but discover you based on the immediacy and context of your content. Real time helps, real good. Pay attention. Find out who is talking about you, in what capacity, and where. And why. Do they have a beef? A compliment? How important is it for your business? Look at most brand's listening strategy – and you'll notice that they often are listening almost entirely for mentions of their brand name. That’s listening with noise cancelling headphones on. In their social conversations, customers do not necessarily mention your brand or product in precise and perfectly phrased ways. Make sure your listening caters to those whims. It just asks for better listening. You may have the right listening strategies and tools in place, but do have people who know the art of listening. There's a difference between listening and hearing. Listening requires focus, understanding, and interpretation. You need the right people, the right teams who are able to convert the "chatter" into useful data and insights. Your efforts will only be as good as the people running them. So make sure you have structured your social team with people who know how to listen, what to listen for, and what to do with what they discover. Your response strategy is really an extension of your listening strategy. To make your social listening work, you have to be able to and be willing to respond very quickly in response to what's being said. This may mean giving the social media team authority to respond in real-time, or developing a social newsroom specially-equipped to produce content rapidly for social sharing. You should have a clear tiered response strategy – perhaps with bands like 'critical-immediate', 'urgent-within 4 hours', 'critical-but needs input from team', 'customer care-urgent' 'ok to respond next day' etc. The success of your response strategy is dependent on the speed of your response and the solution you provide. Your new age mantras: Be There. Be Useful. Add Value. Do it Right Away. When your target audience is saying something and looking for a solution to their need, you need to first be there. Just being there with the right content, the right message is key. What you really must focus on is to be useful for your audience at that moment – that's providing value in the immediate, in the now. You need to really think seriously about unique, tangible ways your brand can help solve a problem or make life easier in real-time during a micro-moment. And, you can only do that if you start with the right consumer insights. Providing value, providing resolution to a need in the moment is key. You need to act on it quickly. Listen. Analyse. Respond. Build on what you hear. And generate interesting engagement driven content around that. That's how you can improve your social media engagement, and get better ROI on your efforts. A timely reminder for marketers that social media is really all about being aware of what is happening around your brand. What people are saying, what other competitors are doing, what is trending.